Fireworks extensions are of two main types: commands and command panels. If you find yourself repeatedly performing a tedious task, you could write a command to automate the process and save yourself a lot of time. Alternatively, if you are missing a particular feature that would improve your workflow, you could write a more complex extension — a command panel — to implement it. Although Fireworks is an excellent screen design tool out of the box, it has benefited greatly from contributions from the Fireworks community — namely, developers such as John Dunning, Aaron Beall and Matt Stow, among others, who have written many indispensable extensions, such as SVG Import and SVG Export (which add full-featured SVG support to Fireworks), Generate Web Assets, CSS Professionalzr (which extends the features of the CSS Properties panel to Fireworks CS6) and many more. Now that Adobe won't add more features to Fireworks, the ability to extend the app becomes important. writing a simple extension to increase a document’s canvas size automatically. Below are the exact locations of the Commands and Command Panels folders on both Mac and Windows. When should you write a command, and when should you write a command panel? Generally, a command is useful for automating some action that requires no or very little user input, such as pasting elements into an existing group or quickly collapsing all layers. A command is also easier to build and test. 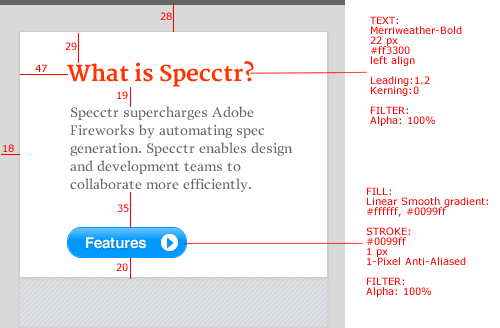 The “Expand Canvas” feature in the Specctr plugin. In the History panel, select and move a text object. A “Move” item will then be added to the steps in the history. You can also select and “replay” a history step (or set of steps). We can save this code to Fireworks’ “Commands” menu by clicking on the “Save steps as a command” button in the bottom-right corner of the History panel. Once this simple command has been saved to the Commands folder, you’ll be able to run it from the “Commands” menu, use it in more complex Fireworks batch-processing scripts and more. Whenever run, the command will move any selected object on the canvas 2 pixels to the right along the x-axis and 46 pixels down along the y-axis. You can also easily customize this command by editing the x and y values in the .jsf file that Fireworks saved at the location described earlier in this article. This was a very simple example, but it shows that developing a Fireworks extension is not that hard — at least not in the beginning! This doesn’t interrupt the code from executing. Because Fireworks does not provide any way for you to set breakpoints in the code, logging to the console is the method that I would recommend when debugging extensions. When the formatting of the Console’s output gets too long, it leaves something to be desired. So, to see the properties and values of objects (object methods are not shown) in the Fireworks DOM, I use Aaron Beall’s DOM Inspector panel, another indispensable companion in my journey of developing extensions. The getDocumentDOM() method invocation returns only the DOM object of the currently active document, rather than the entire Fireworks DOM, and allows us to manipulate that document via its properties and methods. For example, the moveSelectionBy() method (which the History panel taught us about) does the work of moving elements around the document’s canvas. Acting on the current selection is a common pattern when developing Fireworks extensions. It mirrors the way that the user selects elements on the canvas with the mouse, before performing some action on that selection. Given an origin in the top-left corner, this tells Fireworks to move the selected object by x pixels to the right and by y pixels down. The other two boolean parameters (false, false) indicate to move (as opposed to copy) the selection and to move the entire element (as opposed to a sub-selection, if any exists). Like the moveSelectionBy() method, many other Document DOM methods act on the current selection (cloneSelection() and flattenSelection(), to name two). Using what we have learned so far, let’s write a simple command that will expand the size of our canvas. Now, let’s see how to change these dimensions. To set the canvas’ size, we call the setDocumentCanvasSize() method of the Document DOM. Here, the rectangle is bounded by the object; therefore, the canvas is 200 × 200 pixels. (Check the beginning of the article to see where to save your .jsf commands if you are on a different OS.) I leave it as an exercise for you to write and save a simple command that cuts the canvas’ size in half. We’ve covered the DOM Inspector panel and how to use it to check the properties and values of various parts of the Fireworks DOM. We’ve written a simple command to change the canvas’ size automatically. (The Project Phoenix extensions, recently rebooted by Linus Lim, are also worth mentioning. They include Font List, Super Nudge, Auto Save, Rename, Transform, Alignment Guides, Perspective Mockups, Retina Scaler, Layer Commands, Used Fonts and many others.) Finally, below you’ll find an incomplete list of resources to help you along the way. If you think I’ve missed something important (or if you have any questions), let me know in the comments. I’d be happy to help. “Extending Fireworks,” Adobe This is the official guide to developing extensions for Fireworks CS5 and CS6 (including the “Fireworks Object Model” documentation). FireworksGuru Forum Want to ask John, Aaron or Matt a question? You’ll probably find them here. Fireworks Console, John Dunning This is a must-have if you write Fireworks extensions! “Creating Fireworks Panels, Part 1: Introduction to Custom Panels,” Trevor McCauley This was one of the first tutorials that I read to learn how to develop extensions for Fireworks. McCauley has written many cool extensions for Fireworks, and this article is an excellent read!